In the 14th century, the Begijnhof was home to an order of women, called Beguines, who lived as nuns without taking religious vows, which allowed them to remain less restricted than normal nuns. 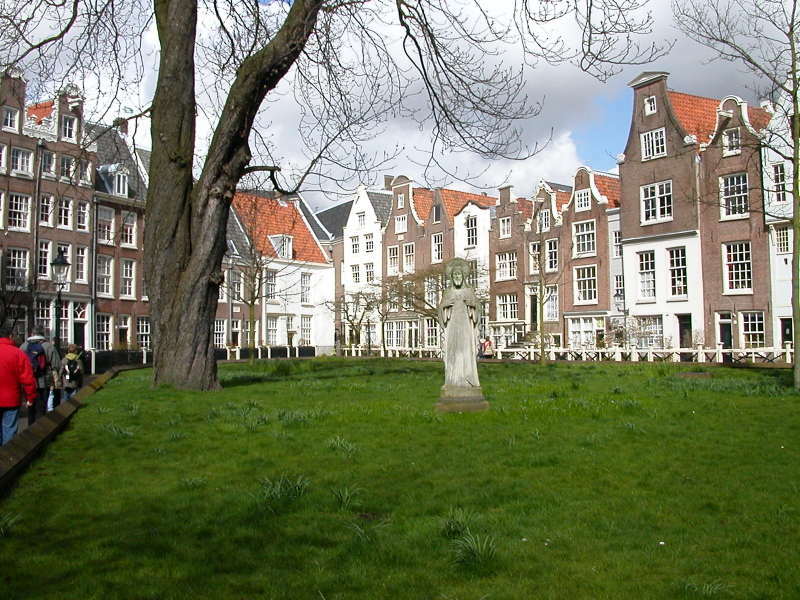 The Beguines began in the Netherlands, and were provided housing in return for their work with educating the poor and taking care of the sick. Although none of the original houses have survived, surrounding the well-maintained green courtyard are still some of the oldest houses in Amsterdam, including one of the only two remaining wooden houses in the city, the Het Houten Huis at No. 34. These homes are still occupied today by young women students and elderly family-less women. I entered into this secluded island of tranquility from the Spui entrance, an inconspicuous archway on Spui between Gedempte Begijnensloot and Nieuwezijds Voorburgwal – walking on Spui from Rokin toward Nieuwezijds Voorburgwal, it will be on your right. The Nieuwe Zijde (New Side) on the western side of Amsterdam, is home to Dam Square where tourists abound in this hubbub of activity among the Koninklijk Paleis, the National Monument, the Nieuwe Kerk, all the street entertainers, the ice skating rink (in winter), the shopping malls and shopping streets, the restaurants, etc. Today I visited the Nieuwe Kerk (New Church) to see the Indonesian Exhibit. Throughout the years it has hosted many exhibitions of treasures from other countries and cultures, often working in collaboration with other museums. The Indonesian exhibition consists of around 330 archeological and anthropological treasures from Jakarta’s National Museum of Indonesia and the National Museum of Ethnology of Leiden in the Netherlands. This exhibition reunites many collections that were divided up between these two institutions as dictated by official policy in 1862, when Indonesia was still a colony belonging to the Netherlands, and emphasizes the cooperation between the two countries as equal partners. I was especially impressed by the giant sculptures and Buddhas, as well as, with the Nieuwe Kerk itself, with its beautiful gothic architecture, stained-glass window featuring Queen Wilhelmina, the elaborate Great Organ, and the tomb of Michiel de Ruyter. After breakfast, Dave headed to work, while I headed to the Monday morning Noordermarkt, which is spread out in front of the square surrounding the Noorderkerk (North Church) in the Western Canal Ring. 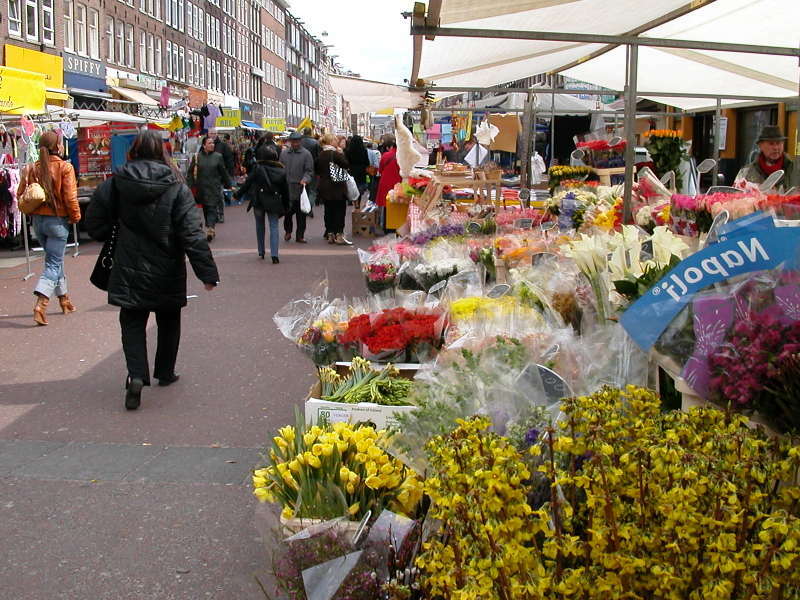 This square has been a market site since 1627, when it sold cookware and old clothes. Today it is predominately a flea market selling cookware and old clothes … and records, antique furniture, fabrics, jewelry, etc., etc. It was much more lively and more extensive that I had imagined, stretching beyond the square and down along one of the long side streets. 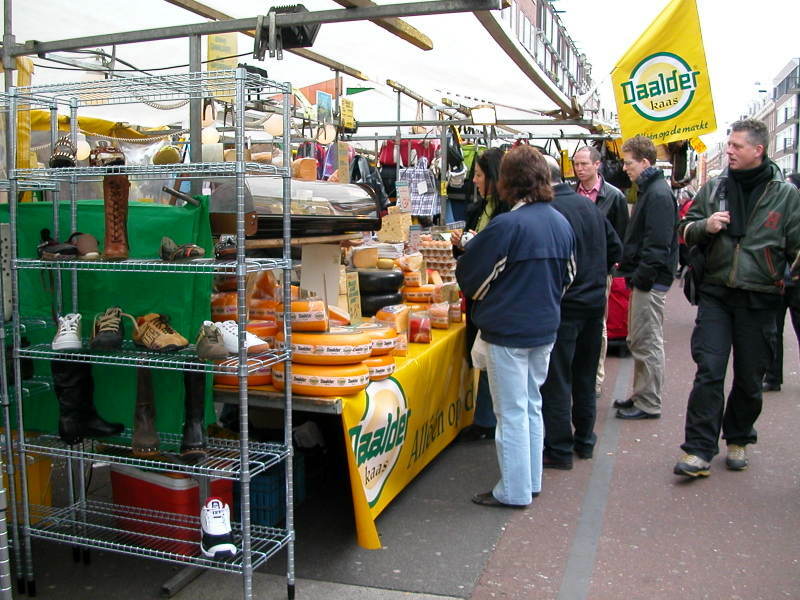 The Noordermarkt Flea Market is every Monday from 9:00am to 1:00pm. 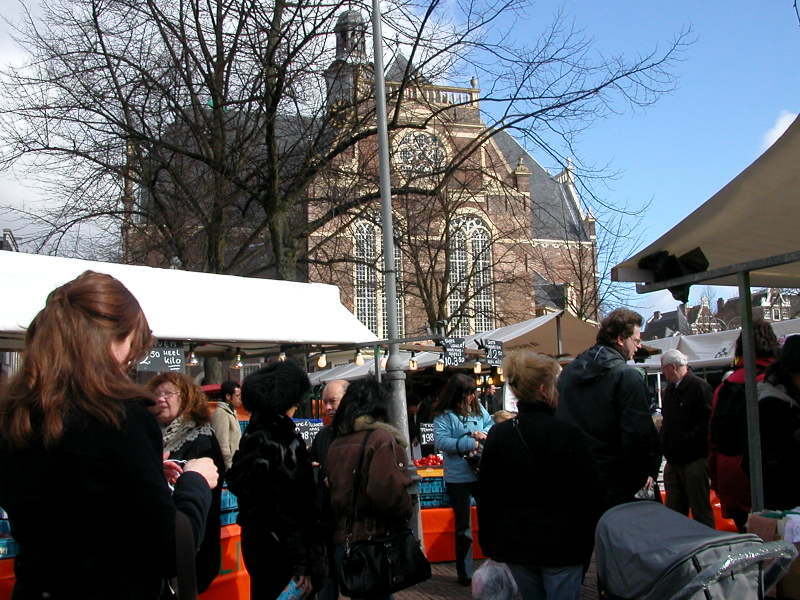 The Biological (organic) Food Market takes place here in the same square every Saturday from 9:00am to 4:00pm. Continuing the Market Day theme, I meandered through the entire horseshoe of canals to the De Pijp district in the Eastern Canal Ring to Amsterdam’s largest and most well-known market, the Albert CuypMarkt, which is open from Monday to Saturday from 9:30am to 5:00pm. It runs all along the street called Albert Cuypstraat, named after the Dutch landscape painter, and you can find everything here from cheese, to flowers, to fish, to sausage, to clothing, to shoes, to furniture, to yarns and fabrics, and so on and so on, along with some of the best prices in the city. The permanent shops behind the stalls, on either side of the street, are also fun to peruse through. The market can get pretty crowded, especially on weekends, but today was not bad at all. It took about an hour by train from Amsterdam Centraal Station to Rotterdam Centraal Station, where we arrived just in time for lunch at a cozy little wine bar which served great sandwiches. 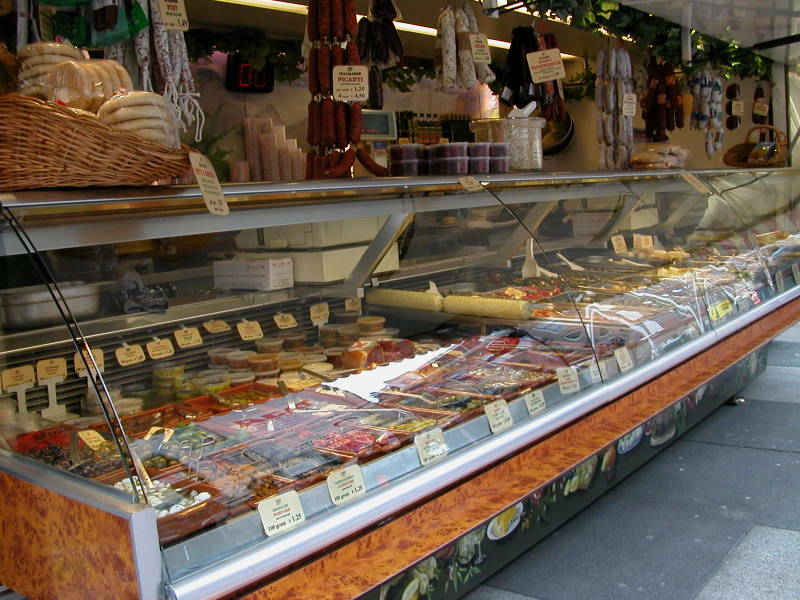 It is called Nostra, and it is located at Van Oldenbarneveltstraat 127. We found Rotterdam to be quite interesting. Much of it had to be rebuilt after the bombing of World War II left the core of the city almost completely destroyed. 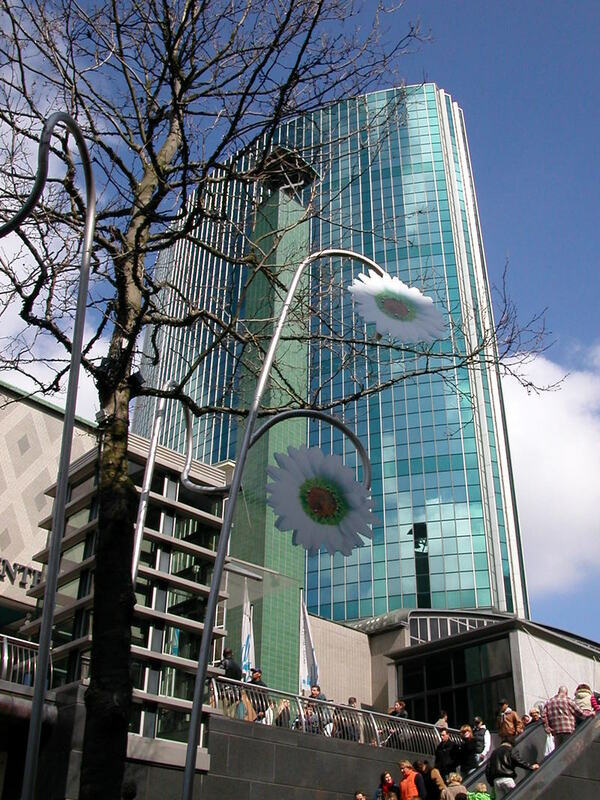 What resulted in its reconstruction is a city with very interesting and very modern architecture, which has now become Rotterdam’s trademark. Then there is the atmospheric corner of Rotterdam called Delfshaven with the typical Dutch architecture that you might expect to see. This part of the city survived the aerial bombings of World War II, and the 18th-century warehouses have been converted into apartments, shops, and cafés, all along its own picturesque harbor. Last weekend we strolled along the canals of Venice. 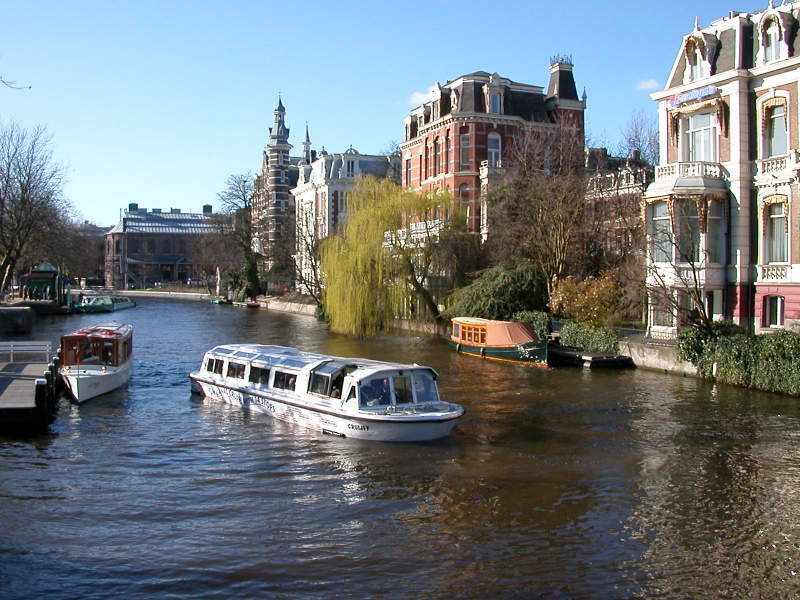 This weekend, we’ll stroll along the canals of Amsterdam. We took advantage of another one of Dave’s business trips to Amsterdam by taking a BasiqAir flight from NCE to AMS on Saturday morning, giving us the weekend to play before he has to go to work on Monday. We started out by going to the highly-touted Rembrandt-Caravaggio exhibition, presented by both the Rijksmuseum and the Van Gogh Museum, to commemorate the 400th birthday of Rembrandt. The exhibition is presented in the not-so-picturesque Van Gogh Museum, maybe because the beautiful Rijksmuseum is still only partially open while going through a major renovation. In an artistic confrontation between the two Baroque artists from northern and southern Europe, Rembrandt van Rijn (1606-1669) and Michelangelo Merisi da Caravaggio (1571-1610), face off on the walls of the Van Gogh Museum, from February 24th to June 18th. Rembrandt was born four years before Caravaggio’s death, and never viewed any of the works of the Italian genius. However, Rembrandt may have been indirectly influenced by the works of Caravaggio, through other artists that he admired and who were familiar with his work in Italy. They both used ordinary people as models for their paintings, and they both are described as masters of Chiaroscuro, which, according to dictionary.com, is described as the technique of using light and shade in pictorial representation. They differed, however, in their style. While Caravaggio’s style is distinguished with clean, clearly defined lines and precise areas of light and shadow, Rembrandt’s works have a distinct diffused lighting effect. We both found the exhibit, which consisted of around 30 paintings, to be outstanding. 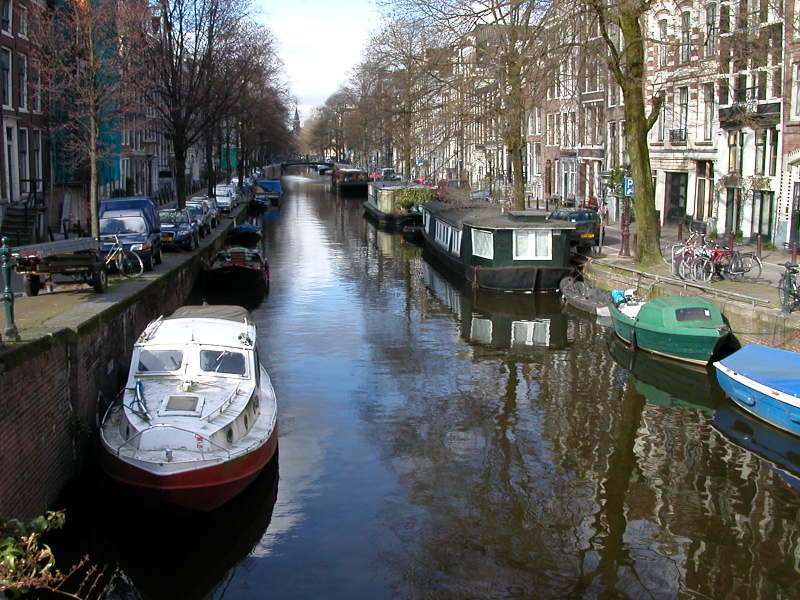 In times gone by, the flower merchants would sail up the Amstel River and moor their small vessels in the Singel Canal to sell their cut flowers & plants directly from their boats. These days, the floating boats have been replaced by floating stalls which now float permanently at the Bloemenmarkt. 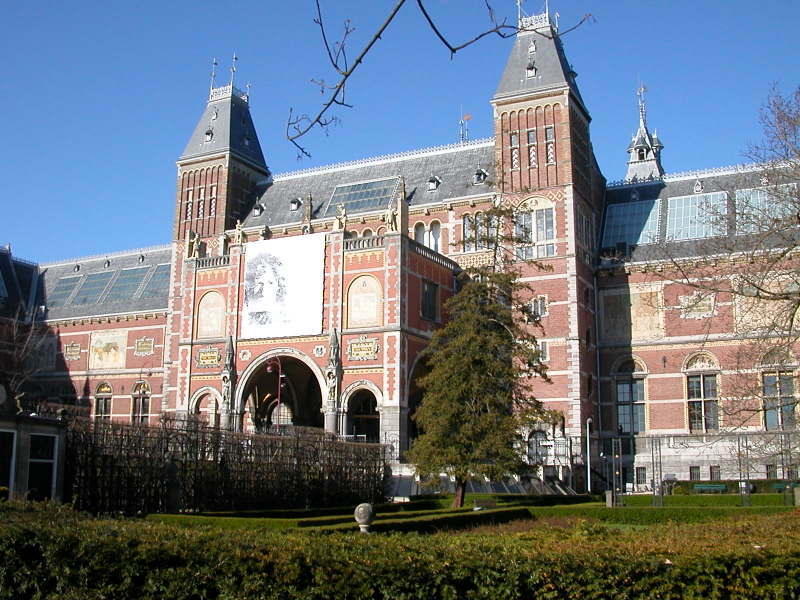 The Rijksmuseum is probably the most important museum in Amsterdam, housing the works of the Old Dutch Masters such as Rembrandt, Vermeer, Steen, and one of my favorites, Pieter De Hooch. Rembrandt’s “The Night Watch” is probably one of the most well-known and most popular works in the museum, and is well worth a visit. 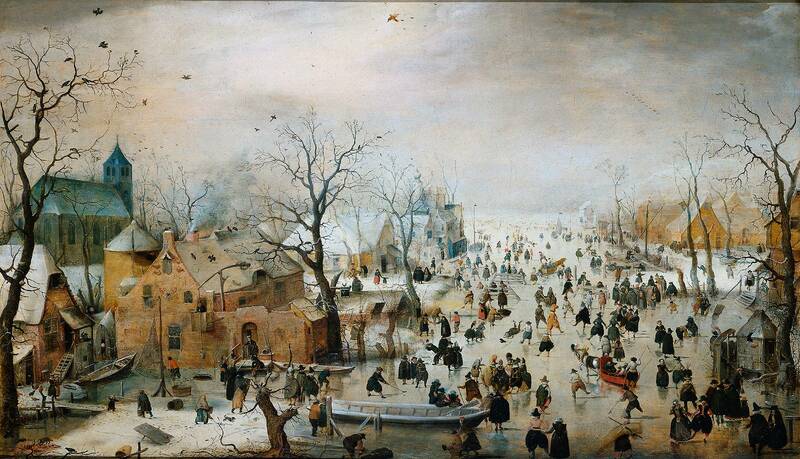 I also especially like Vermeer’s “The Kitchen Maid” with its deep blues and yellows and subtle lighting; and I can spend more time than I should checking out everything that’s going on in “Winter Landscape with Skaters” by a deaf and mute painter named Hendrick Avercamp. What I like about Pieter De Hooch’s works is that he gives the viewer a keyhole into another scene, either a small view into another room of the house, or a small view outside toward a canal, such as in “The Linen Chest”. After spending the morning wandering around alongside the canals in Amsterdam, Dave and I met up with Dana at the hotel, and the three of us tried to escape the rain showers by taking the street car to the Van Gogh Museum. The museum has quite a nice collection of Van Gogh’s art, including “The Potato Eaters” from his time in Nuenen in the Netherlands, and “The Bedroom at Arles”, “Vase with Sunflowers”, “The Yellow House”, and many others which he painted during his time in France. One thing that rather surprised me was that he spent only four years living in France. It was a rather prolific and a very torturous period in his life. It took 45 minutes per snel trein (by fast train) for Dave and I and Dana Nelson (one of Dave's colleagues from the states) to get from Amsterdam Centraal to Den Haag Centraal. 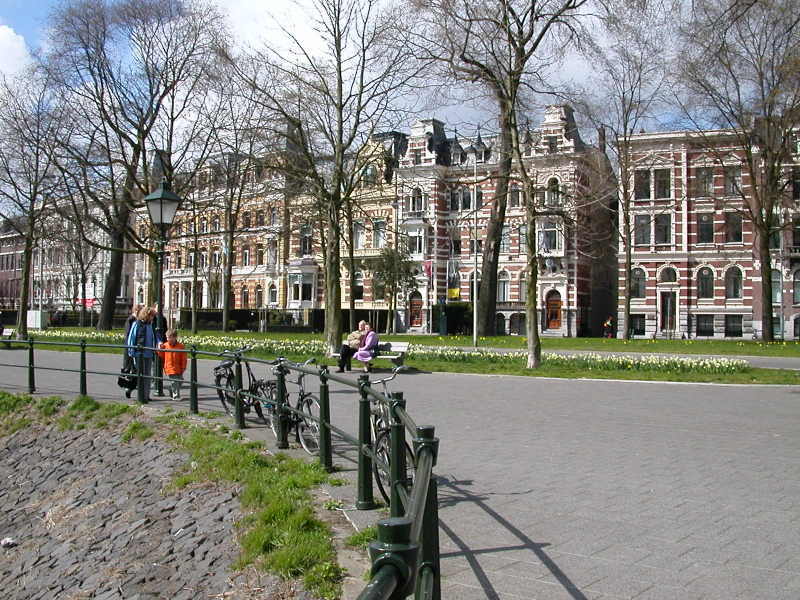 Den Haag has a very picturesque centre ville with lively, cobbled pedestrian streets. 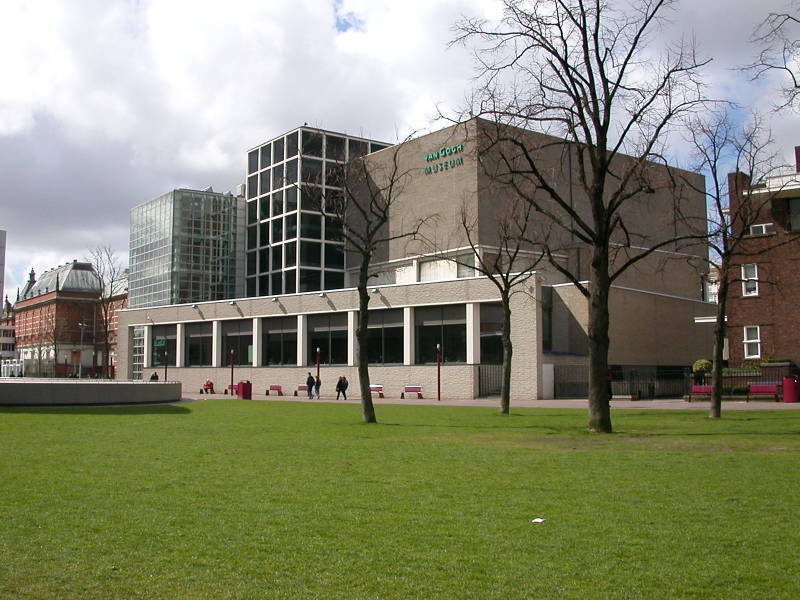 It is the political capital of the Netherlands, and it is home to the International Court of Justice. Our first stop in Den Haag was the Mauritshuis, an elegant 17th-century Dutch Classical mansion which sits on the Hofvijver (lake) and directly next to the parliament buildings, and which has housed the Royal Picture Gallery since 1821. The Mauritshuis is home to Jan Vermeer’s 1660 painting, “Girl with the Pearl Earring”. According to the gallery commentary, it is not a portrait of a single model, but, rather, it is a composite of several women that Vermeer had known.